Southern Accents – A Designers Delight! 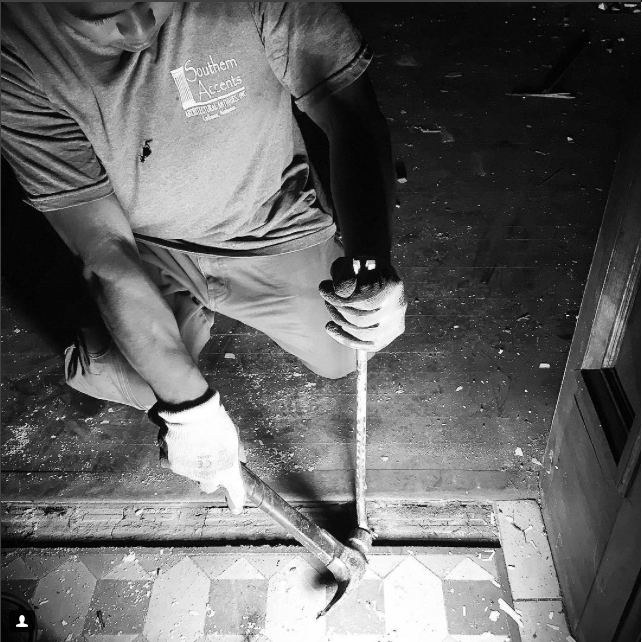 We love working with designers, especially those who share our passion for salvaging and preserving architectural treasures. We are fortunate to have worked, and continue to work, with some very talented designers, including Samantha Oaks from Nashville, Tennessee. Samantha came to us recently upon the recommendation of her client! She was looking for a set of doors to use at the entrance of a listening room. 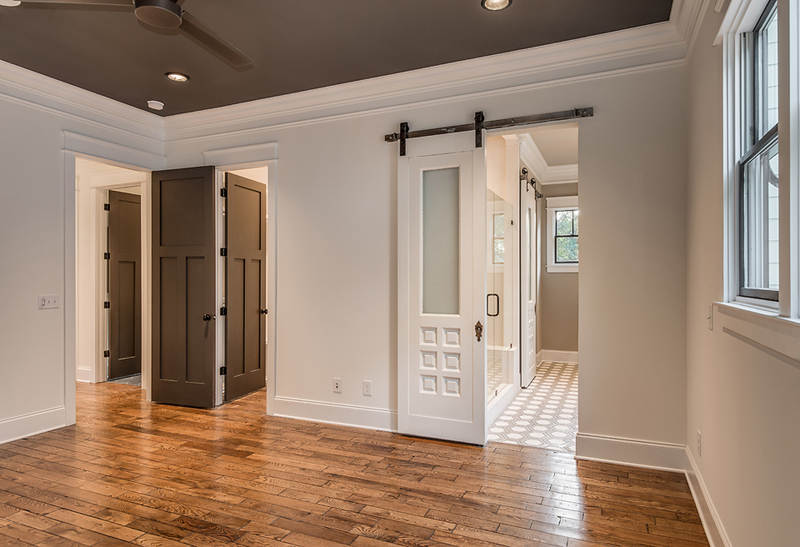 Not only did Samantha find the perfect set of doors and hardware for this project, she also walked away with a second pair, which she converted to sliding barn doors, as well as an antique mantel for the clients home. 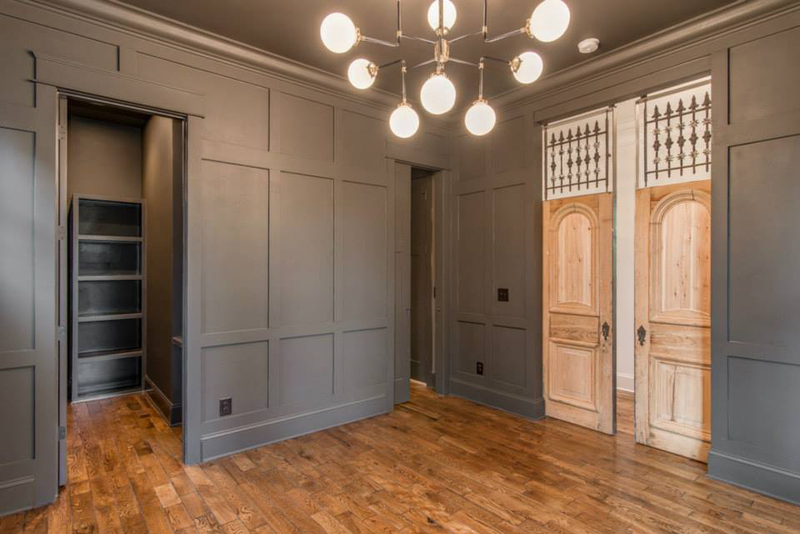 The set of doors that Samantha selected for her client’s listening room was originally covered with several layers of black and white paint. Although the doors were too short for the 9′ opening, Samantha was drawn to the character of the doors and was determined to find a way to make them work. 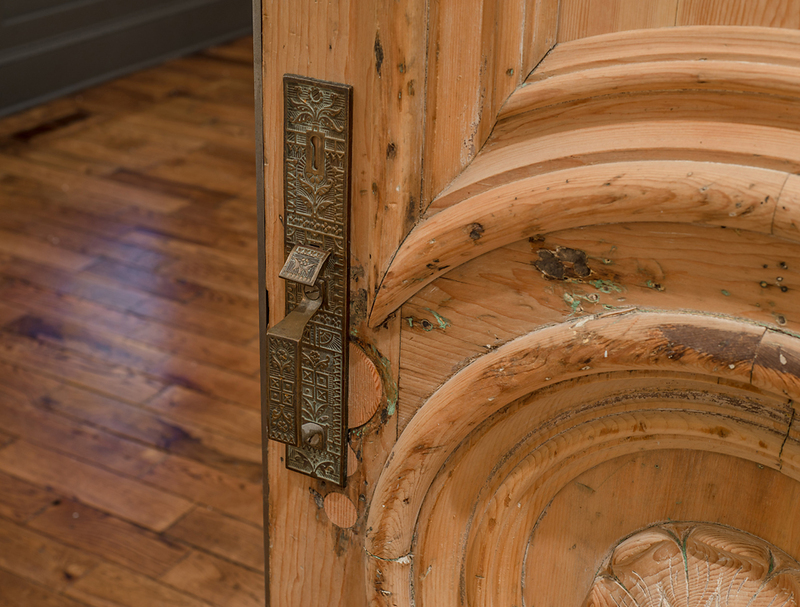 We stripped all the paint from the doors, which revealed the gorgeous wood grain and detailed carving. Samantha came up with the idea to use iron window grates at the top of the doors. Not only did this solution balance the height, but it also allowed light to stream through. Being a big fan of vintage hardware, Samantha chose the fantastic antique handle which added the perfect finishing touch! Samantha also told us that the use of salvaged architectural items was one of her favorite elements that she often includes in her custom designs. 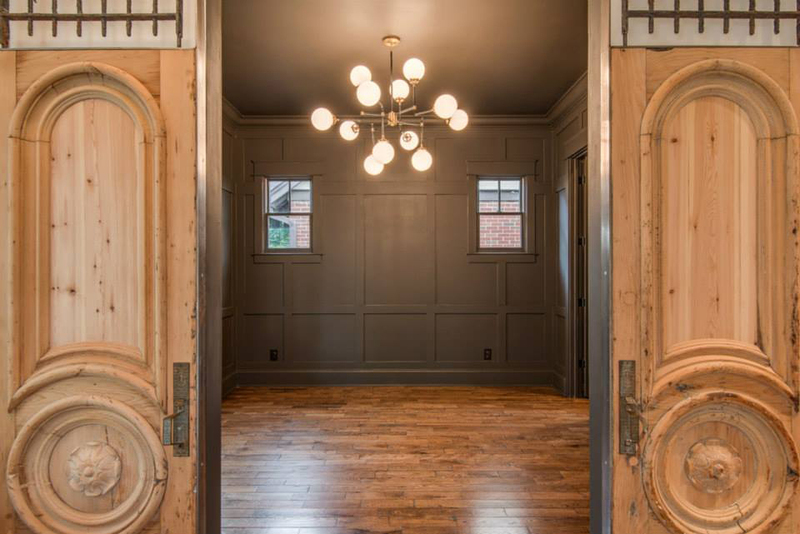 She loves incorporating vintage items into a new construction to create a truly unique space for her clients. We loved working with Samantha and think that the finished project looks amazing! You can find Samantha online at lucienporterdesigncompany.com. You can visit Southern Accents at sa1969.com or visit our showroom in historic downtown Cullman, Alabama! 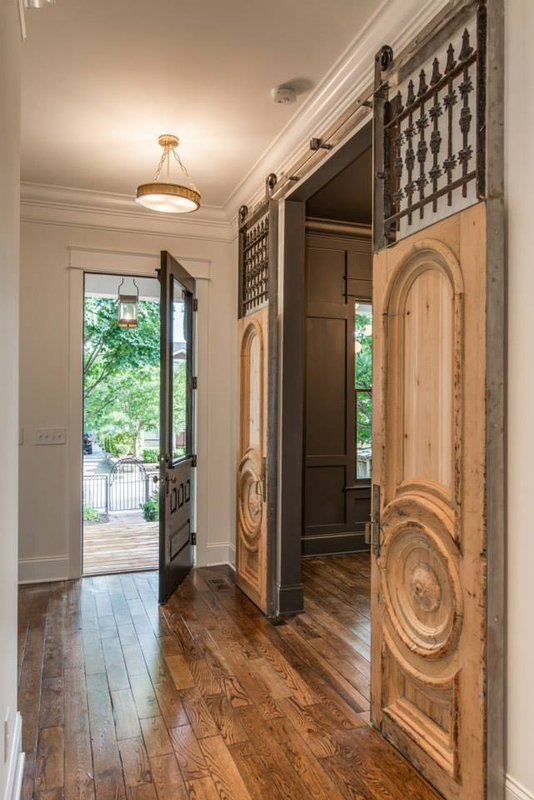 Samantha turned these two salvaged doors into sliding barn doors for her client’s new home. 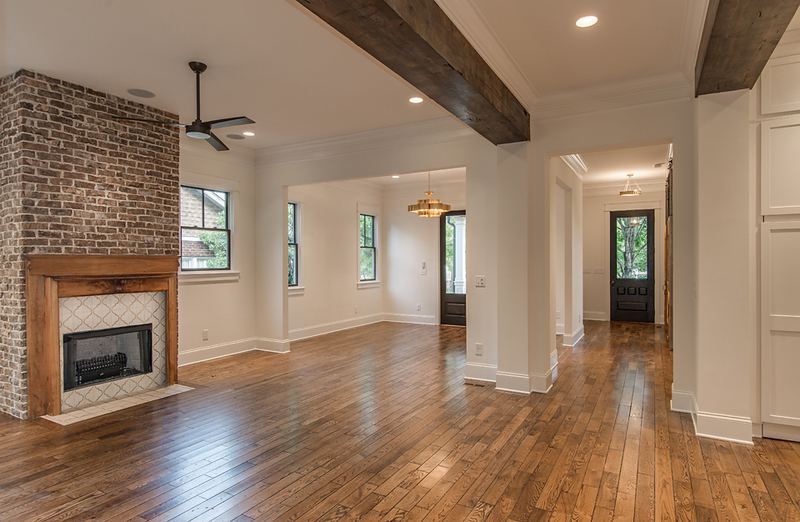 The antique mantel Samantha selected from Southern Accents added the perfect finishing touch to the new family room. 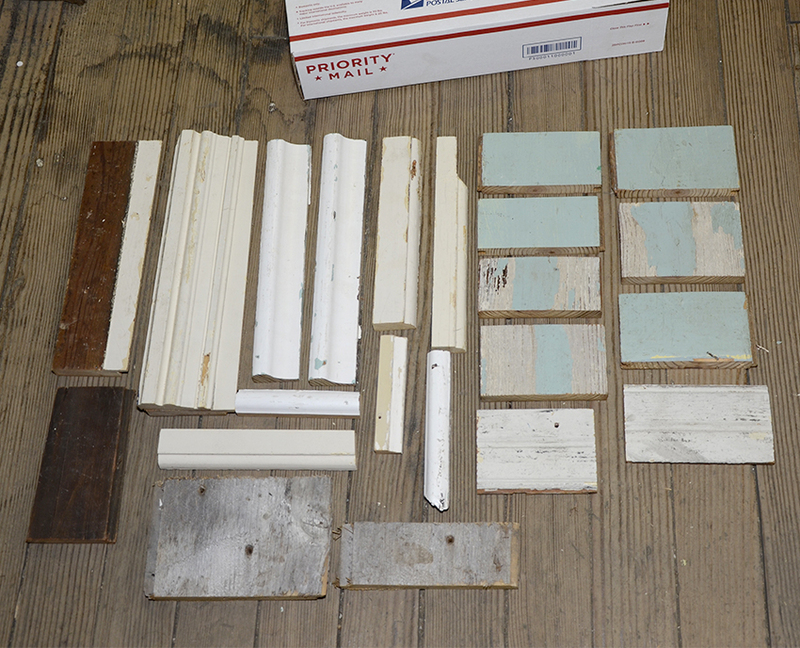 Salvaged and reclaimed wood has become a large part of Southern Accents architectural salvage business. 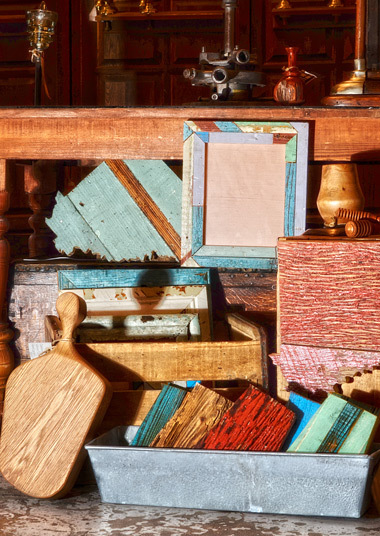 Travel one mile down the road from our main showroom and you will find our wood showroom, stocked floor to ceiling with a variety of salvaged wood, beadboard, trim, hand hewn beams and circular sawn materials. 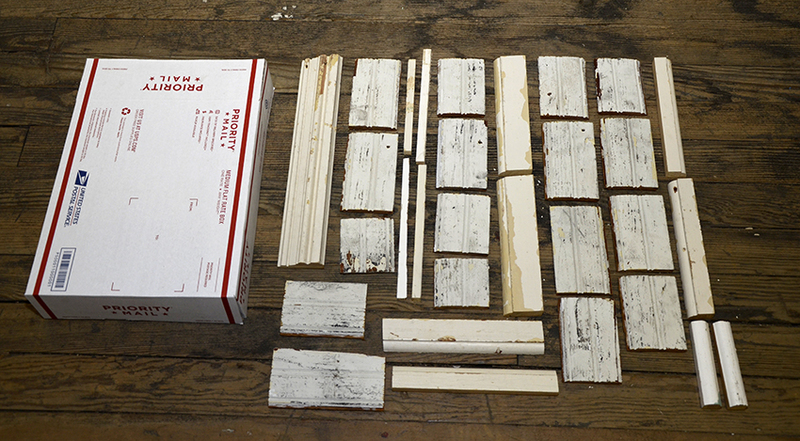 One of the first questions we are asked is, “where does it all come from?” While we have several sources for our salvaged wood, much of it comes from our own salvage missions. 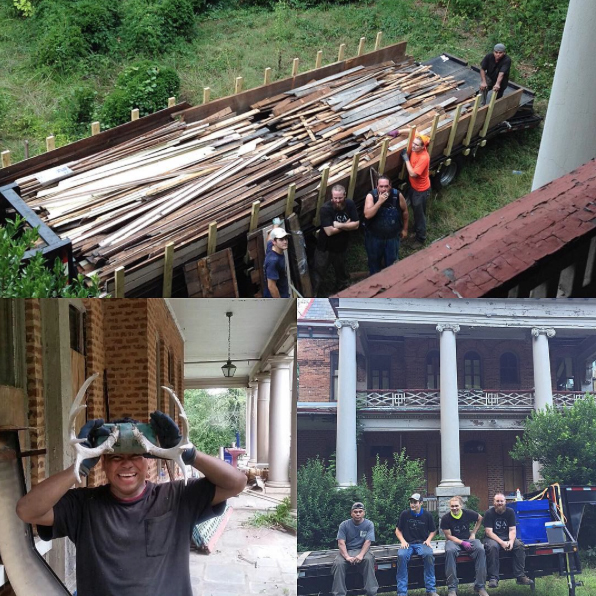 This past weekend we traveled to South Carolina to begin the process of removing wood flooring and wood joists from a house scheduled for demolition. The wood flooring is carefully removed one board at a time. 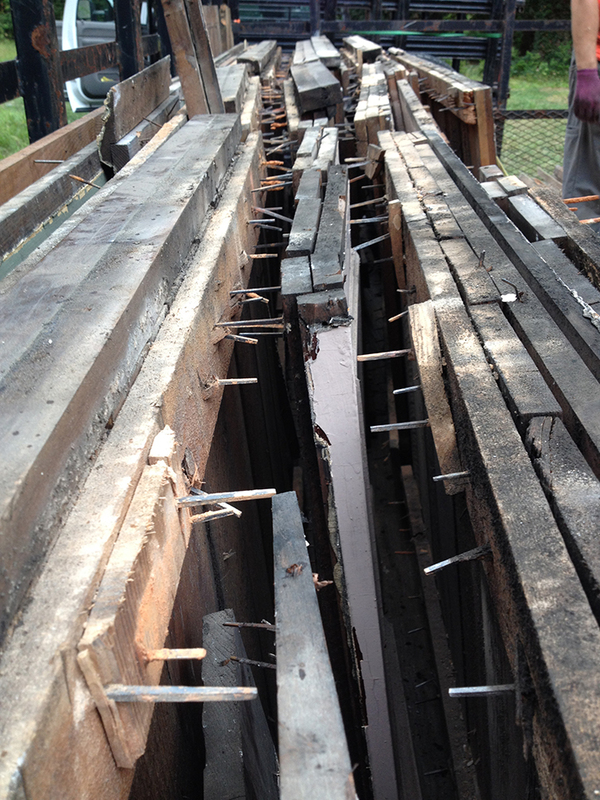 The process of salvaging wood from a structure is not an easy or glamorous task! 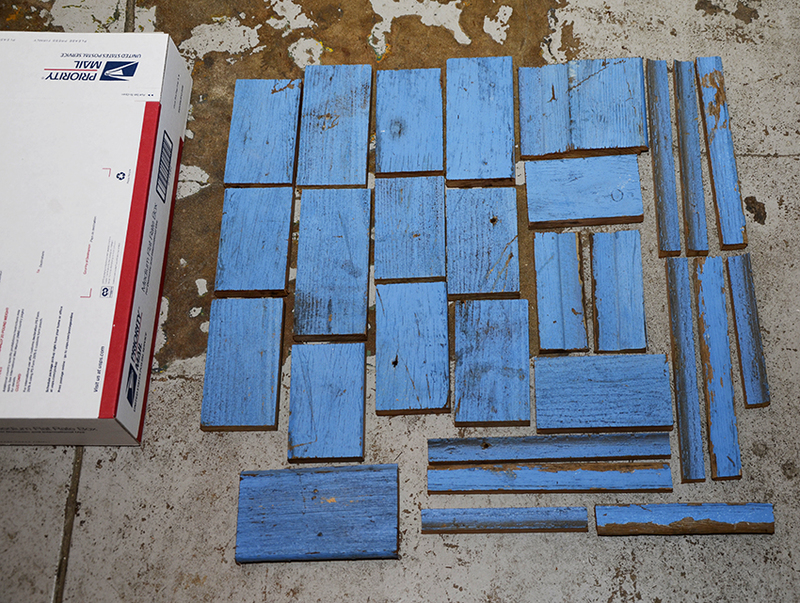 Our goal is to carefully remove the wood so that it remains intact, and therefore, can be reused or repurposed. 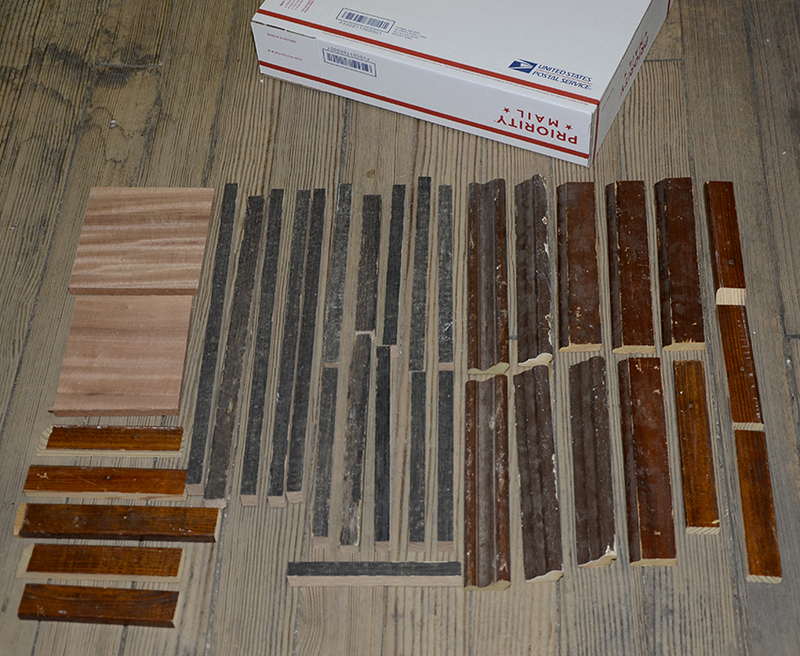 Before starting the wood salvage process, we first have to evaluate each individual room. We look at each room and try to figure out what the original builder, from 100 years ago, installed last. This “reverse building” will determine what we will today take out first. Building, just like our deconstructing, is a process. Many of the older homes have undergone renovations or room additions, so most often there are variances in the construction method from room to room. 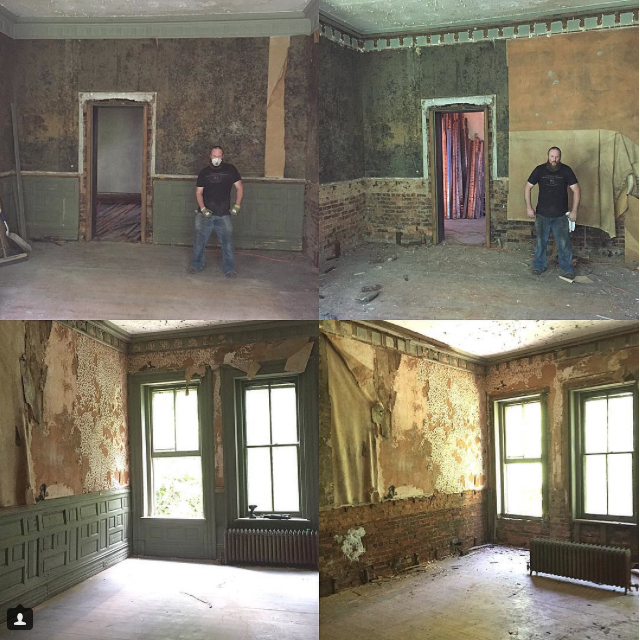 Our goal is to deconstruct each room from top to bottom, removing wood from the ceilings, walls and floors such as trim, baseboards, molding, and wainscoting. Our days typically begin at sunrise and end late in the day. The wood has to be removed in such a way that the nails usually remain intact so that the wood does not split. Most often we are working in an environment that has been vacant for many years. As we begin pulling and cutting the wood, generations of dirt and dust are stirred into the air, filling it with a fine mist of particles that seem to quickly settle in every exposed pore of our bodies. It is a tedious process, but each and every individual piece of wood is finally pulled, removed from the house, and carefully stacked on our truck or trailer bed. By the time the wood is ready to travel back to our showroom, it has been touched numerous times. Handling each piece is also a difficult task in itself as there are rusty nails protruding from each piece. The wood is carefully stacked on the trailer, rusty nails and all! To say that this is a “dirty job” is an understatement. It is dirty, sweaty, grimmy, back breaking labor. Housing for our SA demo team for most of our projects is an RV parked at a camp ground. Once our work day ends, we return to our camp, hit the shower and go in search of a hot meal. Even though our bodies are tired, we crack jokes on each other and pick and play just to have some fun so we can get our minds off the work that awaits us the next day. We work hard but we also have fun! Once our trucks and trailers are full, we begin the journey home, but the process does not end there. 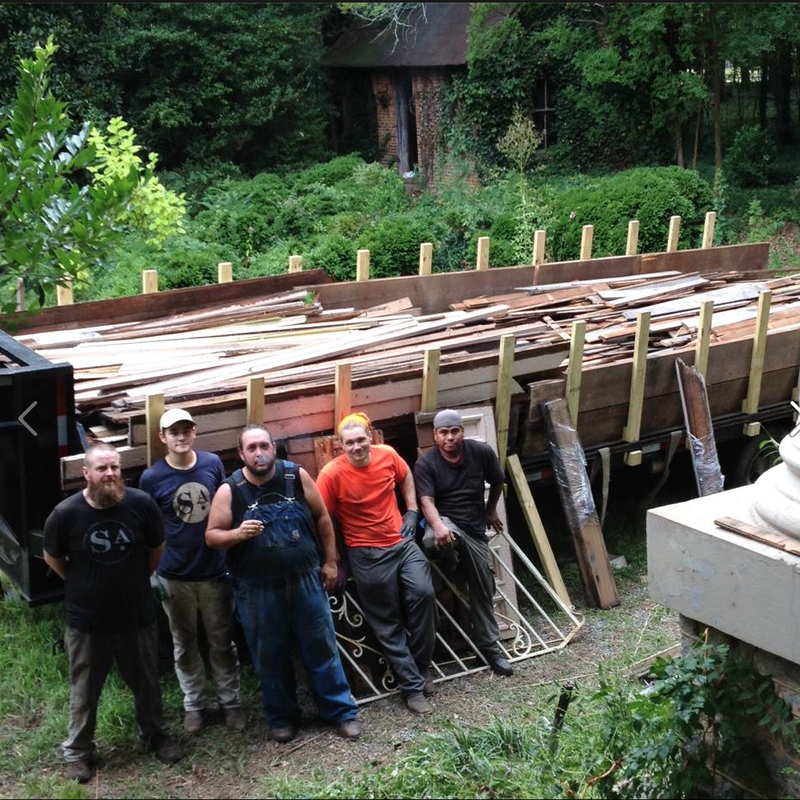 Upon arriving at the wood showroom, the wood is carefully unloaded. We then begin the task of de-nailing each and every piece. The wood is then sorted, according to species and size, re-stacked, labeled and prepared for sale. The life of a junk man is not glamorous, but it is satisfying. At the end of the day, our hard work of rescuing a piece of history and then later seeing the excitement of our customers in our showroom as they select the salvaged material for their project is enough of a reward to push us to that next project! One of my earliest memories as a child was my parents, two sisters and I going on a family vacation. We would travel in our full size van, with a cooler loaded with sandwiches and drinks, and drive in a large circle around the southeastern United States. My father would be at the helm of the wheel as my mom was co-pilot. My sister Jill would keep the conversation going talking about her life and adventures of the trip, while my other sister, Joy, would be fighting me for the Rand McNally map that we would use to highlight our precise location and giving directions of our next destination. The cassette player in our brown and tan carpeted van would be playing Conway Twitty, George Jones, Dolly Parton, Johny Cash, Charlie Pride, and other tapes of country singers, while I was in the back listening to Run-D.M.C. and The Fat Boys with my headphones. My parents would take us, sometimes drag us, to antique stores, with an occasional cemetery thrown in, to round-out what we called the “Gudger Summer Antiquecation.” Our trip usually took us through Birmingham to south Georgia, then Savannah, up to Charleston, then to Salisbury, North Carolina, then through Charlotte, Knoxville, Chattanooga and finally back to Alabama! Some of those early trips are a few of my favorite childhood memories. While traveling in the van on those antiquing trips, I learned a life lesson from my mother. Nearing the end of each summer vacation, the van fully loaded and by now, a packed UHaul in tow, our excitement level of exploring the next antique store had worn off! Upon each stop my mom would utter two words, simply, but boldly, “GET OUT!” The meaning was clear… get out of the car and let’s go inside. I didn’t realize that those two words would somehow stick with me throughout my life, even when she wasn’t around. As an adult, I now realize what my mother was doing! She is an adventurer and a curious soul, like myself, and in her mind she was trying to teach us a valuable lesson… “get out” was her way of encouraging us to get out and experience what that particular place had to offer. Each stop to her was an adventure, an opportunity to explore new, unknown and exciting places and things. The hands on experience of exploring the texture, the color, the temperature, even the scale… truly has a lot to do with my design work at Southern Accents today. She was teaching me through these “get out” experiences, without me even knowing. I believe that an important part of life is making that extra effort to just “get out!” There are too many times that distractions, like technology, keep our head glued to a screen. Whether it is editing pictures, Facebook, text, email, social media, spread sheets… sometimes it is just good to take a step back, put away your phone, tablet and/or games, and just “get out.” Get outside, get outside the normal box of thinking, get out and experience friends, get out and make something with your hands, get out and just breathe! There is a time to work and when you work, work hard. But there are also times to experience a positive new place, activity, friends, company… by choosing to go that extra mile, that most people won’t, a new journey begins for you. I believe that I inherited my curiosity from my mother. I hope I can instill that curious nature in my boys. Without us knowing, my mother allowed us to have a summer field trip that consisted of a hands-on laboratory at every stop. You never know what you will find unless you “Get Out”. Life is an adventure: experience it! Written by: Garlan Gudger, Jr.